William was born on January 11, 1839 in South Carolina. He married Nancy Elizabeth Evans on April 14, 1861 in Anderson County, Texas. Nancy was born on October 23, 1840 in Tennessee and was the daughter of John Henry Evans and Nancy Caroline Cantrell. On May 8, 1863, William enlisted in the 20th Texas Cavalry, Company G in Palestine, Anderson County. He was 49 years old and served for 3 months. William purchased land from his father, the deed is included in William Alexander’s information. At some point in time, they moved to Erath County, and then to Stephens County, Oklahoma. The 1880 census records show that W.A. Cook, age 41 born about 1839 in South Carolina lived in Erath County, Texas married to Nancy E. Cook, age 39. His parents birthplaces were both in South Carolina. He was a farmer. Children were: William G. Cook, age 16; Nancy C. Cook, age 13; Chenley Cook, age 8; Ellen Cook, age 6; Amanda Cook, age 4; Arabella Cook, age 1; Hettie Cook, age 1. 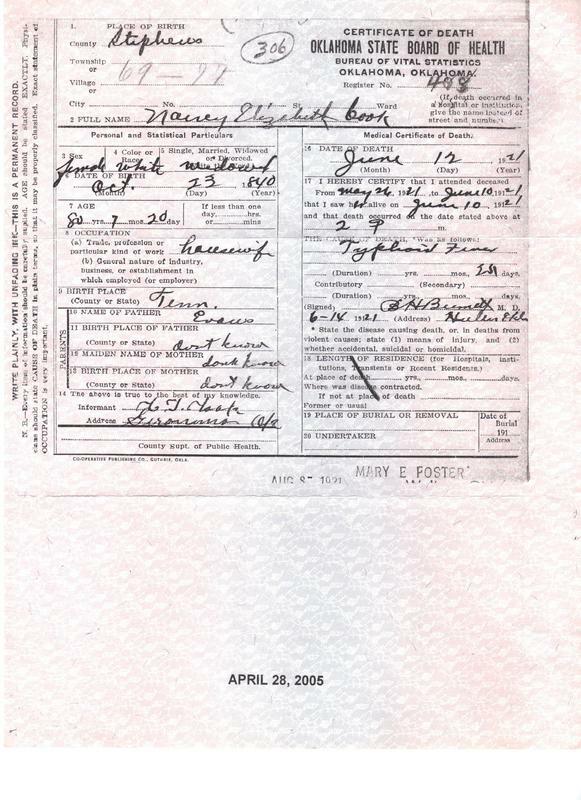 The 1910 Census records show William, age 71 and Elizabeth (Nancy), age 69, living with their daughter Ellen and her husband James McInroe and family in Rock Creek, Stephens County, Oklahoma. William died March 19, 1918 in Duncan, Stephens County, Oklahoma and was buried on March 20, 1918 in Rock Creek Cemetery, Duncan, Stephens County, Oklahoma. Nancy died June 12, 1921 also in Stephens County and is buried beside William.